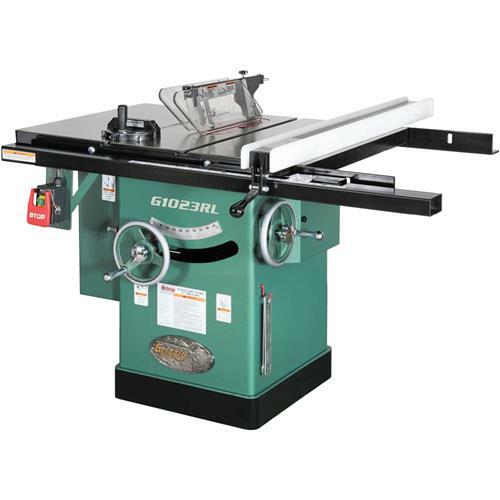 It took nearly two years of refinement & design optimization to improve our best-selling "G1023S" series table saws. The result is our new line of "G1023R" series table saws, featuring all the best from the old models plus a new riving knife system, serpentine-belt power transfer that runs quieter & smoother, encapsulated dust collection around the underside of the blade, & an improved quick-release blade guard. CSA certified meeting CSA C22.2 #71.2-08 and UL 987-7th standards! Table size (with 2 solid extension wings attached) is 40" x 27"
Maximum depth of cut @ 90° 3"
Maximum depth of cut @ 45° 2-1/8"
Approximate shipping weight: 508 lbs. I originally purchased an 833 and found a fatal flaw when raising the blade. Deflection that is unable to be corrected, much like the Ridgid TS had. I measured .017 thousandths movement. Per usual I notified GRizzly and they allowed me to return the Hybrid Saw, and buy the REAL saw. This 1023 is the real deal and can be adjusted at a professional level... Gibs allow deflection correction!!! HUGE... I actually had to tweak them, and now this saw is straight as an arrow. The quality of this saw is incredible... Fence is solid and accurate. Do yourself a HUGE favor and spend the few extra dollars for this saw over a Hybrid IF you can run this saw at 230, instead of 110. Good quality product from Taiwan... and what a difference from the hybrid. Its hard to beat a Grizzly for the money. I wish the quality control was a little better in some areas but there are no issues in areas where it really matters. I do feel the quality is a tad better on the G0690 having owned both models. I was missing parts but Grizzly wasted no time shipping out the parts. Overall it cuts perfectly and has plenty of power. I bought this saw to upgrade from a Craftsman saw. Bottom line this saw is great. The fence is nowhere near as good as the saw. I listed some issues my fence had with mine below. I had several pictures but for some reason all of the others came up as forbidden or something. Not a file size issue. The bearing pads on the bottom were not on my fence when it arrived. Grizzly took care of that. 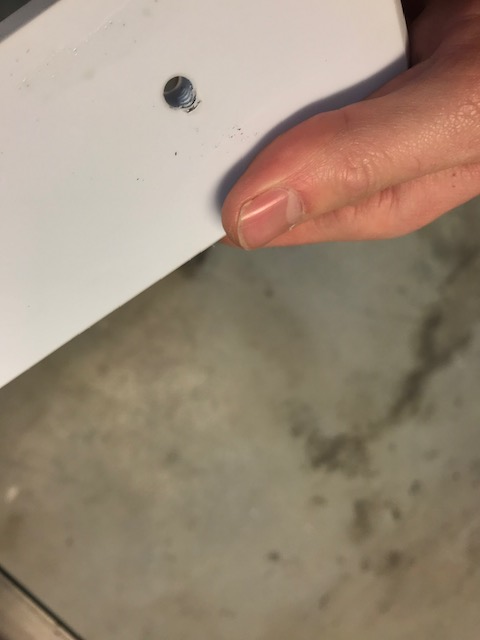 Two of the screws that hold the UHMW on the fence were broke. It seemed like cheap fasteners so it was pretty easy to drill out and clean up the threads. While I was working on that I discovered that another fastener was actually bent. I ended up taking both UHMW sides off and cleaning up all the holes. However, when I did this I discovered that none of the holes in the UHMW lined up with the holes in the steel tube. I endued up having to open every hole up a couple two or three drill sizes on both of the UHMW parts. The major issue here is that the pitch is actually not even. If I make a new fence I have to try and measure each spacing and layout to match. During reassembly I discovered was that the bolts also were not drilled and tapped straight. I am sure that all of this together is why I had broken bolts. The likely just snapped during the assembly at the factory. The worst part of the saw is the magnifying indicator on the fence. It is so bad I will have the guys in the machine shop fabricate a new one for me and then I can throw the one that came with the saw in the trash. Have it 2 weeks works great, runs great. Upgraded from a dewalt 1.75 hp. Quiet a difference. I bought this about a month ago to replace my Radial Arm Saw that finally died. I much prefer using the RAS and find it a lot easier to do many more things. Just to crosscut on a Table Saw, I have to build a sled. Does the wheel give a measure of depth of cut? No. Why not? Well, now I have to use some tool to make sure the depth is correct. The one pawl does not fit properly and digs into the little plastic tab each time I lower the blade. The fence fitting is really poorly designed and can come loose very easily, messing up a cut. Otherwise, I guess it is just fine, but I had a 220V 10" 2.75 HP RAS, Commercial Grade and sorry, all you guys that think a Cabinet Saw is better - it isn't. I ordered the G1023RL Monday in the late afternoon of 4 Feb 2019 with the Bear Crawl mobile base and it was delivered on 8 Feb 2019 by UPS with lift gate service. All boxes where in great condition with one minor tear in box 2. All parts and pieces where fine and nothing missing. So great delivery experience. The saw went together perfectly and every check for flat, square and parallel where dead on. I was amazed I rechecked just to be sure and other than one little adjustment to the fence everything was dead nuts perfect. WOW! !.The cast iron wings where so lined up with the main table after a few dead blow taps you cant even feel the line between the pieces where they join again perfect fit. I looked for quit a while at all the usual brand name cabinet saws at lots more $$$ and I can honestly say this saw is as good and better in fit and finish than all the competition. Ive owned other cabinet saws with the big names and in my opinion this saw beats them all in the $4500 or less price point. In my opinion you cant buy a better saw for the price point of this saw and it beats the more expensive ones in fit and finish and performance is as good or better. Im am so happy that I decided to take a chance on this saw I would buy it again in a heart beat. One really nice surprise was that Grizzly upgraded the fence rails so the left rip capacity is 14 not 8 and the right rip is 32 as stated in the owners manual. Some of the spec sheets show older specs still and found out I believe that the rip capacity was updated in 2017. I would highly recommend this saw at this point and did some test cuts on 10/4 walnut and maple as well as ash. Cut like butter. I believe this saw will give me a lifetime of service with proper care. Thank you Grizzly for a great product and excellent customer service. With all the savings I realized well more $$ for project supplies and wood. This is the best value period!!!! This saw is the work horse on my cabinet/furniture shop. It has all the power that is needed. It plows through 12/4 oak with ease. The only downside was the dust collection. Splinters of wood would plug the 2 inch hose around the blade housing so we removed it. We also drilled out the plate designed to stop splinters from getting to the dust system. Our central system doesn't mind splinters but the plate reduced the vacuum power of the system on the saw.exhaust port. With those modifications we love the saw. We push a lot of wood through this saw. The removal of the dust system does require us to cleanout the interior of the cabinet weekly as the blade adjustment screws get clogged with sawdust. But that is a small price to pay for good saw operation. The Shop Fox Rip fence is a little finicky to get parallel but once adjusted is fine. Overall a good saw for the price point. We have had the saw for a couple of years and the only part we have replaced is the blade raising assist piston. I normally dont give a review so soon, I wait until I use it for year to see how it works. The shipping was fast, the boxes was damaged, especially the box that contained the fence, there was no missing parts. No damage to either the fence or saw. When I bought my 15 planer it way crated with plywood, not in cardboard boxes. You would think something this expensive, they would give it better protection. The assembly was easy and quick. The set up was fairly easy for exception of the rivier knife, I kept adjusting the the screws the wrong way, Grizzly needs to design that better. The power switch is to far to back from the edge of the fence, which is a safety concern, again Grizzly needs to make it so you can mount the switch flush with the face of the fence rail, he fence rail already has two holes for this purpose. Installing the was quite simple, I only needed one 1/4 washer spacer between the square tubing and the angle iron. The fence is really heavy, but it holds Square, and doesn't move when fixed in place. The two wings are flat, flush, I did not need to use tape between them. Squaring the miter slot to the fence was simple and easy. I will update in about a year from now on the performance. - Not sure about that internal dust collection arrangement, time will tell. - Disappointed with the alignment of the Fox fence and guessing how many shims to put under the front rail tube. - Could not see how to adjust fence face perpendicular to the table surface. Consider selling a smaller table top extension (16"x27") to cover the gap between the fence rails to the right of the extension wing. Overall, very satisfied with the purchase... much improved over my previous machine. Best purchased I have made in a long time. Saw worked great right out of the box with very little trouble setting it up and dialing it in. Just make sure you have someone to help you set it up because this is very heavy saw. I finally decided to replace my 20-year old Grizzly Table Saw (which still works great). I was hoping that the money for the upgrade was worth it. It appears that my new 1023RL is so much better in many ways. It runs much quieter and with much less vibration. Also the table surface and fence are much larger. The instructions were very clear and easy to follow. I could only find a few minor issues to report. One of the table extensions was very slightly out of level. With leveling both ends, the center was very slightly higher than the table top, probably about 1/64" at the most. Additionally, the magnifier on the fence scale is a bit hard to read. Lastly, the power cord was a bit short for my shop, but was easily replaced with longer cable. All-in-all, the saw seems great! Can't wait to use it! still very happy with the table saw as well as customer service. after receiving another fence and installing it I have to say I am nothing short of impressed with the quality and operation of the table saw and fence.. I am very pleased with my new table saw. My only complaint is that in the separate box that the fence was in, the box was damaged and there was no scale to install on the fence runner, so I had to purchase a 3' stainless steel rule and pop-rivet it to the runner, which probably works better than what it was supposed to get. I have many Grizzly products and have never been disappointed! Very happy with the saw. Some assembly is required but saw blade was parallel to the table t-slots and fence was parallel to the blade right out of the box. I bought my first Grizzly Table Saw (Model G1023) in 1988. A few months later I bought the G1182 Jointer. I never had any problems with either machine and construction quality and accuracy were never a problem. A recent move forced me to sell the machines, which I didnt want to do. I finally caved when I saw the movers cost estimate as well as the opportunity to upgrade to more modern features with newer units. 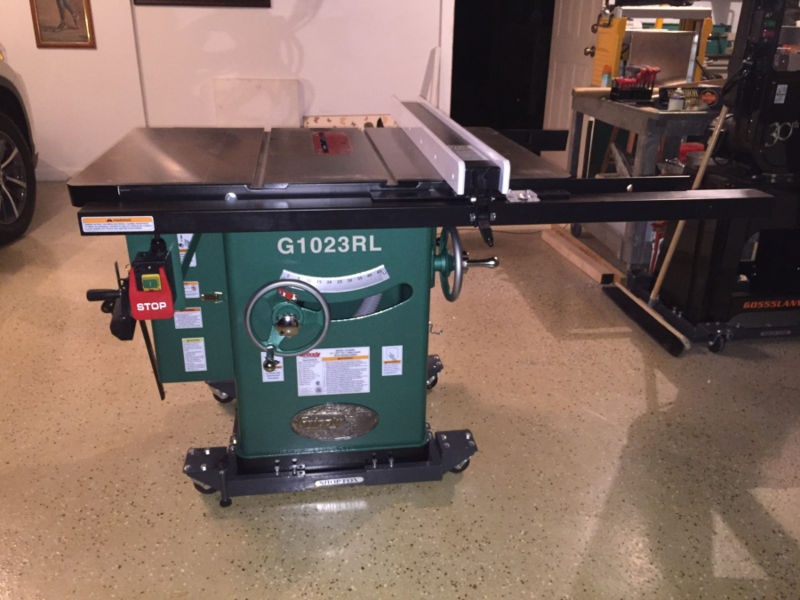 After our move I purchased the new G1023RL saw and G0814 jointer to go in my new woodshop. Aside from the pricing almost doubling, Im very pleased with the quality and workmanship of these two units like I was 30 years ago. I havent been able to give the machines a thorough workout yet because my woodshop is still under construction so will reserve the performance part of this review for a later post when Ive made substantial sawdust. The focus of this review, therefore, is the service I received from Grizzly when portions of my order arrived damaged. I followed the instructions on the order for visible damage at delivery, taking pictures with my phone, and ensuring the shipping company documented the damages on their paperwork as well. The box for the table saw fence rails was nearly in two pieces when it arrived and therefore noted with pictures and description on the shippers invoice. The next day, however, when I unpacked and assembled the fence system there was not one scratch or dent and it adjusted perfectly to the saw cabinet. The big surprise was the (already assembled) jointer stand in one of the other boxes that had little to no visible damage from the exterior. The base between the feet on one side was bent as though it had been squashed by something coming down on it at an angle. It was useless because it could not sit flat on the floor. Customer Service couldnt have been nicer. I sent photos of the damage and they promptly send me a new stand in exchange for the bent one. Although it took a while and another call to Customer Service, a shipping company came and picked up the damaged unit it went back to Grizzly at their expense. Sure there are nicer quality saws and jointers on the market, but for the price and type of work I do and these machines are great. And, always consider serviceability when making purchases like this. The saw was delivered very quickly. Also a pleasant surprise was that an additional discount was applied after purchase. I believe the saw price was reduced before it shipped. The only reason I didn't give an excellent rating was due to a missing mounting hardware pack for the fence system. I had to wait an additional week to complete the assembly and as a result I have not yet had a chance to use the saw. I'll update or add another review once I've had a chance to use the saw. I have had this saw for a week and enjoy the quality and rigidity it has. Assembly and setup with a dial indicator was easy, no stress, No items were missing or damaged. This is an upgrade from a portable contractor saw, I thought a while til I pulled the trigger on this purchase with no regrets.The wheeled base allows me to tuck it out of the way when I need to. I'll be spending the winter in my heated shop banging out cabinets in my free time. I bough the RLX a few years ago along with the roller table. My shop is the size of a closet and space management is a must thus the side table, absolutely no assembly problems . After many years of attempting woodwork projects on substandard equipment, I've come to appreciate the importance of precise and repeatable table saw work. Since retirement, I decided it was high time to invest in machinery capable of high-quality results. Hundreds of reviews and much thought brought me to choosing the G1023. It was a little above my budget but I felt I was worth it. After receiving the saw I know I've made the best decision for my needs and shop size. I couldn't be more pleased with the engineering and craftsmanship of this product. Right off the pallet, my machinist square reported that the 90 degree stop was spot on with the included blade. The cast table extensions bolted so precisely that you can scarcely see the seam and didn't require any shims. The slots were parallel to the blade within .003" and I just knew any monkeying with that was going to be a can of worms. Close enough. I must admit that there was a rocky start with some parts loss with the included Shop Fox fence, a shipping and packing problem I've read in many reviews. More robust packaging should be considered for such heavy angle iron fixtures. Rice cardboard just doesn't stand a chance with truck lines. Grizzly did cheerfully oblige me with the missing hardware, fence lock knob, and measuring tape but none-to-quick for me with "economy" shipping. Much customer satisfaction could have been purchased with the dollar saved over priority mail. There was a small scratch in the black vinyl base stripe but a piece of electrical tape would mend it if I even cared enough to correct it. I found the "starter" blade to be adequate and the miter gauge as well. I really liked the set-screw adjustment for fine-tuning to the miter slot width. I did find it necessary to drill through the casting on the miter gauge to allow for the attachment of a wood face. A minor annoyance but worth mentioning. I was concerned that my 2-1/2" dust control arrangement was going to be inadequate to recommendations of 2-3 times the CFMs I could generate but after waxing the sloped inside bottom I found that I only had a minor sawdust accumulation in the base corners and the hinged covers on each side provided easy access for an occasional vacuuming. A very minor inconvenience. 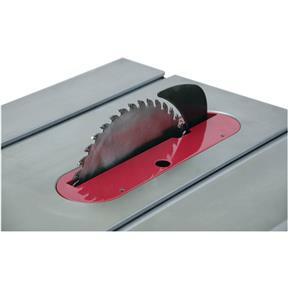 The blade shroud is very effective at removing the lion's share of the dust and providing a rapid exit for a dropped arbor nut. The cosmoline protective coating on the machined casting surfaces was easily removed with mineral spirits. I couldn't bring myself to wasting a bunch of WD-40. I've found the fence to be very serviceable. Impressively accurate and after a minor adjustment consistently parallel. I did have to fiddle with the fence mounting brackets to achieve square to the table. A little extra trouble with the absence of an adjustment on the fence T-square but one that I probably won't have to make in the future. I didn't find the parallax of the magnified curser to be as objectionable as others have reported. 3 HP is very sufficient for my needs. I do hear a slight belt squeal when starting with a full dado stack, a problem that a slight belt adjustment will solve now that there has been some break-in. The motor has never hinted at bogging even on aggressive dado plowing and is whisper quiet, hardly audible above the blade wind. Smooth as silk. I can now see the significance of "Made in Taiwan" so prominently appearing in red ink for the G1023 in the catalog. So glad that I decided to upgrade from the hybrid group. I like the Grizzly G1023RL very much. It was packed well and every thing that was supposed to be in the package was there. I watched How to Assemble the G1023RL numerous times on You Tube before the saw arrived so I was able to recognize each part as it was unpacked and I knew how to assemble it. I had a friend help me with the assembly. It could have been done by myself alone but I run a business and time was important. It took us about 3 hours to complete the task. 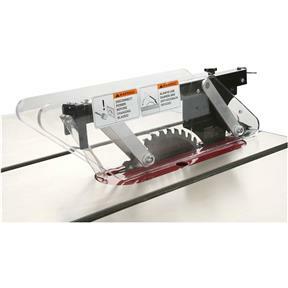 I researched all of the table saws that fit into the category of what I was looking for (about 12 of them) and decided the Grizzly was the best fit for my shop and budget. The saw is very well made and the 3 hp motor has handled the hardest piece of wood that I put through it. In my case it was a 2 1/2 piece of hard maple, without the motor showing any strain at all. I find that the vacuum system does not clear most of the dust out of the bin in the bottom of the saw even though I have a 6 hp vacuum system hooked up right next to it. My research shows that most of the competitive saws have much the same problem so the Grizzly is no better than the rest in this respect. I don't know what you could do to improve the efficiency in this area..
Bought to replace another saw. Got it home, set it up in one evening, and started a project next day. Required very little adjustment. Its 3 HP motor is plenty powerful for my application. Good, sturdy construction and attention to detail. Everything fits tightly and smoothly. Tables are flat, smooth, and heavy. Dust collection is good. My setup only draws from underneath the table. I might add dust collection above the table at the blade later. Whether youre a pro, semi pro, or serious hobbyist, this saw is a good value. I expect it to last a long time and serve as a workhorse in my shop. I haven't had a heavy saw for several years, and always regretted giving mine up. I was thrilled to get this saw into my shop, and it has been wonderful to use. Before I get to the machine itself, let me comment on the condition of items upon delivery. The saw is packaged separate from the fence. While the saw carton was not unmarred, the fence packaging was pretty banged up. I made note of it on the shipping paperwork, took photos, and called Grizzly so there would be a record of the condition before they came off the truck. The Grizzly rep told me to let them know if there was any damage so they could send out replacement parts if needed. Fortunately, the only problem I found was a broken screw that holds the polyethylene face on one side of the fence. It was an easy fix. Now for the saw itself. First of all, get the Sprayway Heavy Duty Orange Degreaser. It makes the cleanup of the shipping coating very easy. Setup was not too difficult; the instruction book is fairly clear. The cast iron table wings went on without needing any shimming. It was easy to align the miter track to the blade. Installation of the fence rails and front glide bar was straight forward. You'll need a second pair of hands when installing the table wings and fence rails. When I installed the blade guard and splitter apparatus, I noticed two issues. First, the unit was not secure and moved back and forth so that the splitter would not stay aligned with the blade. When I attempted removal of the splitter, the second issue presented itself; the splitter was very difficult to remove. Once removed, I was able to identify an Allen Head screw that was loose. Once tightened, the splitter apparatus was stable, however, it doesn't slide in and out easily. At this time I haven't done too much cutting with the saw, but I can say that it powers up and runs smoothly, is not excessively noisy, and ripped 2 x 4s without difficulty. Other than the issues noted above, I am thus far happy with the saw and feel that it is a good value. Product is great, but shipping is terrible. First order refused because of damage to saw. Second shipment had a few scratches, opened and damaged boxes, and missing parts. I accepted the shipment and Grizzly was quick to send the missing parts. Excellent table saw with power to spare. I purchased this as I needed a saw powerful enough to cut through thick hardwood and this saw has delivered. My only complaint is that the start button is sometimes hard to access while preparing to make a cut. I highly recommend this saw. 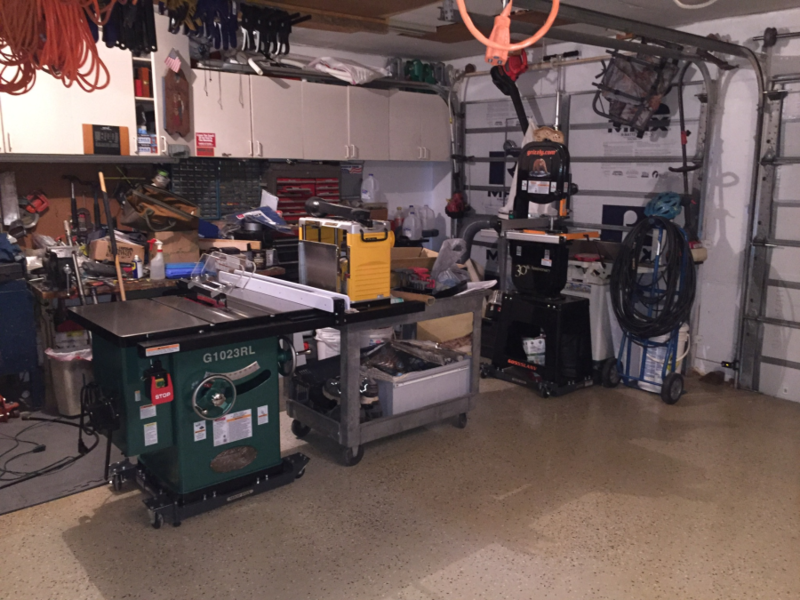 Replaced old table saw ( Delta) with newer up to date safety features. Saw table tops very flat. Easy to assemble and calibrate. I am extremely pleased with this saw. I should have ordered the model with the router table extension. I have ordered the kit to do that. This is a quality product that will be a welcomed addition to your shop. After years of fighting with my old saw, my new saw arrived just in time for Father's Day!!! I struggled for a long time with my decision, but I am very happy with the result. The saw was delivered Friday afternoon. It was too heavy for me to get from my garage to my basement shop even after removing the top and taking everything out of the box, so I hired a couple of movers to come over and get it moved into my shop Saturday morning. I spent a couple of hours getting it set up. It would have gone a lot faster, but I created a few extra tasks for myself by taking the top off. I'm kind of glad I did because I was forced to learn how to align the miter slot and fence to the blade. The saw is so much quieter than my old direct-drive saw and it cuts like a dream; even with the blade it came with. The dust collection is better than I had feared based on hearing people talk about it. My old saw didn't have any dust collection, so I think it's amazing that my whole shop isn't full of dust after making a few cuts. I am thrilled with my decision to buy the Grizzly G1023RL. No complaints on this table saw. The table is extremely flat. The motor is strong. The controls work smoothly and flawlessly. It has a feeling of quality and precision. The dust collection works great. The fence glides smoothly. The guard easily attaches and detaches. Everything I need and nothing I don't in a cabinet saw. I have used a Craftsman table saw for the last 15 years and was happy with it, but its accuracy and strength led me to a great desire to improve. 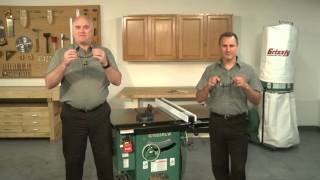 I studied table saws for about 3 months and with all the pros and cons, prices and features, I chose the 1023. Assembly was a little testy because I did it by myself but didn't swear half as much as in other assemblies. The side table were the hardest, but by starting one end bolt with the table piece in a vertical position, I was able to accomplish the task with little effort. I had to install the front fence rail a couple of time using washers for shims to get it right, but again with little effort. Everything was spot on for squareness once the assembly was complete and I waxed the table down and began to test it out. My only problem with it is the cam lock on the blade guard. I have rather long arms but it is still hard to get to and the blade guard or riving knife at the same time. After changing them out a few times for different cuts, I now find the cam lock doesn't seem to actually lock the guard in place. I have removed the blade insert and blown out any dust that may have gathered and checked the lever, but it still doesn't have the feel it did when I first changed out the guards. Other than that, it's a great saw for the price. I bought this table saw recently. The paid for the lift-gate delivery service since I had not way to get it off the back of the truck. The delivery man dragged the load up my hill with his cart and dropped it right in the middle of my shop. The saw was really easy to assembly and included easy-to-follow directions. So far, I have put the saw through its paces and made almost every type of cut I can think of. The motor has plenty of power to rip through long bits of 8/4 stock without slowing much if at all. The fence and miter gauge were very easy to dial in on accuracy (again, good instructions were included). 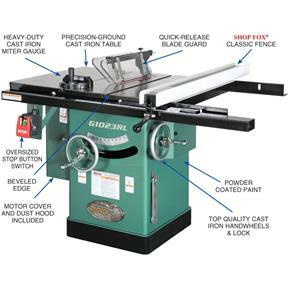 This table saw makes a good addition to any shop. Nice heavy duty machine with plenty of power and great precision . Everything about it speaks quality. Pretty easy to set-up after receiving and unpacking. No issues with setting up. Very impressed with power, smooth running and quite. The miter has a binding backend of the bar. Really happy to add this machine to my collection. Recommend this machine. Well built, our shop hads 3 tablesaws this one works very good Ill be buying more grizzly tools. I am well pleased with this saw with how well everything fit when assembled, I have used other big name brands and the fit was not as good as this saw and I did the nickel test and then a penny and they both stood on the edge with no problem when I started the saw so there is very very little vibration. All the miter groves are good and true so I have nothing to grip about and as a retired machinist I can find little things that I don't like but so far there aren't any. Up and down and tilt is all real smooth. The fence is not real straight but well enough for a good true cut but all in all a good saw. Our son loves this saw. He is a timber framer and also makes one of a kind doors and so this heavy duty saw was just what he needed. I bought this saw several months ago and couldn't be more pleased. Plenty of power and the run out of the table is minimal. Absolutely love it. However I must review the fence separately. It is very lacking, when I assembled it and locked it down the tail moves 1/16 to an 1/8 of an inch. Attempts to correct this action were unsuccessful. I immediately ordered an Incra fence. Wow was there ever a difference. Combined with a Forrest blade this is an awesome machine. I highly recommend this saw with the Incra fence. I've not had much time operating this saw...however, I did some box joints and was really impressed with its operation. Great saw! I have partially assembled the saw. The wings are not perfectly flush with the table...they seem to have slight bows in them...maybe about 1/64 to 1/32 of an inch off in the middle of the wings. Front and backs of wings are flush to table. The on/off swtch arrived with the on button and lock popped off. I haven't turned it on yet, but, i am having a problem with the on button staying in the on position. 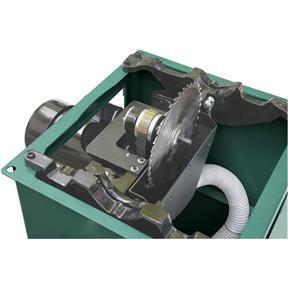 The motor cover strains against the clamp and is slightly disfigured in order to get closed. When i spoke to one of the tech agents i was told if i want accuracy that this is the machine for me...i guess i expected better craftmanship. I only was able to get a sub panel installed to fire up the saw yesterday due to work related travel responsibilities. Runs very quiet and smooth. I plan on my first project to make some free hanging shelf units for a work colleague. The only complaint I have is UPS freight is horrible. I scheduled this to deliver on a Friday. That morning they called me and said that they couldnt deliver. Had to reschedule for the following Wednesday. Took Friday off for no reason. I got this saw about a month ago and it has proven to be a excellent choice. It has all the power that I need. I wish that they would reposition the start/stop switch for emergency shut down. I would not buy another Shop Fox fence it does not move along the table top smoothly. I am in a quandary. Upgrade my old saw (Craftsman 1.0 hp. 10") with about $500 in upgrades or take that money and invest it on this saw. 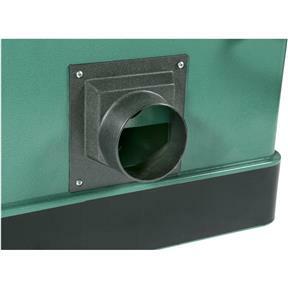 How is the dust collection does one need a large dust collection system with this saw or will a large Shop Vac suffice? Who makes the 3HP motor on the G1023RL, RLX and the 5HP on the G1023RLWX? Saw was easy and straight forward to set up. Aligned near perfect right out of the box. 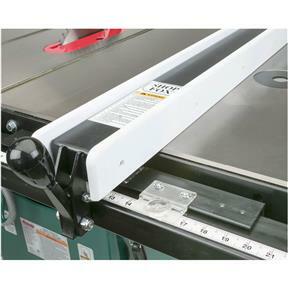 Tons of power, table extensions align perfectly/seamlessly, blade that comes with the saw is super sharp. Couple of notes when setting up: 1. The Shopfox fence needs no washer spacers between the tube and the rail, they get bolted straight on. 2. The instructions don't seem to mention the installation of the right side cabinet access door. I ended up putting it on at the end, no issue. My one complaint was that UPS handled the delivery portion of it VERY poorly and I ended up taking over a half day off for no reason because their "system" said it would be delivered and they didn't even have it in the local warehouse yet. I am delighted with this saw. This is a step up from my old hybrid saw that died on me. The difference between the two is like night and day. It is solid. All surface finishes are good. Assembly was straight forward. The saw functioned properly with the exception of the shop fox fence which does not tighten properly and has to be sent back. Also the handle for the lock broke off upon applying minimal pressure when attempting to lock the fence in place. The saw was a very easy to set up. All of the parts were present and fit perfect. Adjustments were easy and very accurate. Operation is smooth and accurate. The only problem I had was with delivery. I set up a delivery for one day and was told it would be delivered between 10:00 and 4:00. I hired a helper to get the saw into my shop and we sat around waiting for it to be delivered. At 5:15 I was told they would not be able to deliver the saw until the next day. They did deliver it next day but I had to pay a helper a days pay for nothing. If it weren't for the delivery I would not have any negative comments. For the first time in my life, I finally have a dedicated space to call my workshop. I looked and compared saws for about a year now. Knowing that this would be the workhouse, I wanted one that would be built to last. Initially, I decided to purchase the hybrid G0715 primarily because that seemed like the best saw for my budget but I really wanted a true cabinet saw. Then the 715 was discontinued before I could purchase it. Next step up the G1023RL, a true cabinet saw and much more than my budget so I was going wait a little longer before purchasing so that I could pay off some other bills. Here's a sentimental note. My father, getting up in years and an avid woodworker, wanted me to have something that I would enjoy and always remind me of him so he surprised me by purchasing it for me. So far it is a joy to use and it does make think of my father. Grizzly, this saw better last me a lifetime. Ok that aside, here is my experience. For the last 12 years I finished a lot of projects using a Craftsman job site saw. Being a perfectionist wasn't easy with that saw. With the 1023, no problem; ease of use, precision and power there is no comparison. 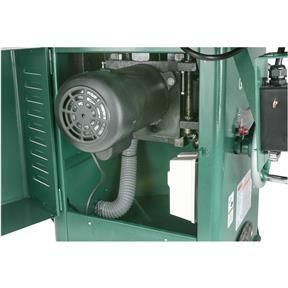 The 3hp motor is very powerful, quiet, smooth and very little (if any) vibration. Excellent cuts even with the standard blade provided. The blade guard is designed well, works well on the saw and easy to remove however like all blade guards, still kind of a nuisance. The saw was actually delivered 3 weeks earlier than expected and the delivery guy rolled it right into my garage which was a relief since I'm a 1 man operation. It was package well and on a small pallet so I think I could have rolled it up to my garage using my hand truck. Set up would've been easier with 2 people but was certainly manageable for this 54 year old. The wings bolted on very straight and true with little adjustment and no shims. No imperfections in the table or wings that I can see. Clean up was fairly easy with WD40 and took maybe 45 minutes (you'll need plenty of paper towels). Blade angles were set perfectly. I love the big burly hand wheels and the smooth action on the height and angle wheels. Also like the way you can lock in the wheel adjustments so consistency is not a problem. Dust collection works perfectly and is well contained. Very little dust appears on the table top and inside the cabinet and I think there will be even less once I set up a dust collector. The Shop Fox fence provided tracks up and down the rails smoothly and parallel to the blade and it locks down tight and sturdy after final adjustments. The rails were a bit of pain to install and required shims. I just used the washers provided as shims. I used 1 shim per bolt but I had to bolt and unbolt several times until I was satisfied with it. Save yourself some time and start with one shim. 2. The Shop Fox fence is smooth and seems to track well but it is heavy and cumbersome. I've tested some fences that easily moves up and down the rail with one hand. Not so with the Shop Fox. I don't yet trust the parallelism every time I move the fence and also the tape measure display can be misleading. The tape measure is just a piece of tape that has to be applied carefully so as not to stretch the numbers out of true. Over your cut mark, there is a chintzy plastic magnifying glass over the tape that is supposed to make reading it easier. Problem is the magnifying glass distorts the reading and you have to be real careful so that you are looking directly down on your your mark while viewing it. If you glance at from the right or left side you will see a different mark. Point being, when accuracy is important, always measure between the blade and fence. 3. The miter gauge was accurate right out the box and seems like a quality accessory but there is no slots or holes drilled into it to attach an auxiliary fence. Unless, I can figure out a way to attach a fence, I will end up replacing this someday. 4. 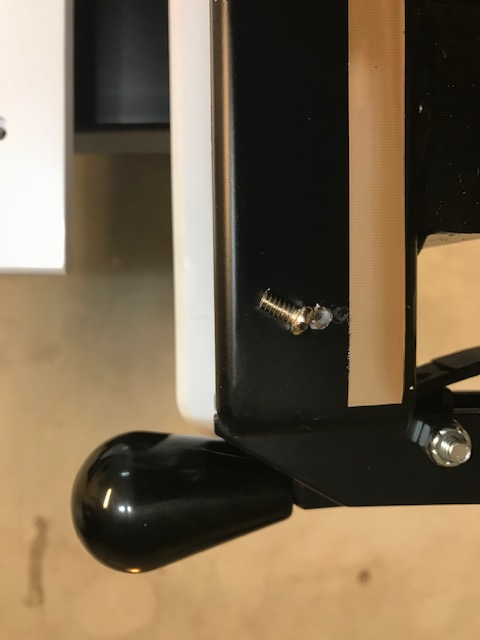 The riving knife is fairly simple to remove but to do so you must access the release through an awkward side panel under the table to get to it. For me it means, getting down on my hands and knees and reaching into a dark cabinet to find the release. I'll admit it, the older I get the more I complain about inconvenience. 5. My biggest complaint was the height adjustment. Up and down movement was smooth and easy cranking as long as the blade was 2 inches above the table top but to lower it below 2 inches was a 2 handed job. I had at least 6 calls into tech support and spent a day and half correcting the problem. Each time I called in, I got a different tech with various levels of experience on these units. Each call I had to start from the beginning to explain my issue, then go through an escalating troubleshooting process. Eventually, a tech explained to me how adjust the 4 gibb screws which was supposed to be set properly in the factory. After several adjustments, I was finally able to fully raise and lower the blade with ease. Unfortunately, before I adjusted the gibb screws, the tech suggested I remove the gas piston that assists with the raising and lowering. That piston is heavy duty and once off the machine it fully extends with no way to compress it without putting a clamp on it. Problem was, it had to be compressed to be reinstalled and could not be installed with a clamp on it. The tech should have known this before he suggested I remove it. I could not find any compression tools that I could buy. After many attempts, I was able to compress it in a clamp and with vice grips and utility wire keep the piston compressed while bolting it back to the machine. At some point, I noticed some oil was discharged from the piston so I know the piston is partially damaged. Needless to say, an extremely frustrating process. I believe Grizzly owes me at least a new piston replacement but that replacement should come with a compression tool so I can re-install it properly. PS - One recommendation I would make to those who are considering this purchase. For another $50 you may want to consider the G1023RLW. Same unit but with a router table extension. To purchase the extension after delivery is going to cost $275 plus delivery. Seems like it would be a huge convenience especially when your limited on space. A quality table saw for a very reasonable price,can't wai for my Grizzly planer to arrive.. Very happy I purchased this saw. It's very solid with more than enough power for my small production shop. Unfortunately I had to return it as it arrived with some damage. Your Customer Service people are great. I reordered this product and am now waiting for it. I've had the saw for a little over a year and a half l, and I'm just now getting around to trying to use it for more precise cuts. The miter gauge is solid, but the set screws in the miter bar don't adjust easily, and there are no through holes or slots in the base for attaching anything as you would see with almost any other gauge on the market. Problem #2, the miter slots are tapered. Seriously! If I adjust the set screws on a miter bar to be tight at the front of the slot, they will be sloppy in the middle. This means there is no point in upgrading my miter gauge, because I'll never be able to adjust one to fit properly (or any accessory that utilizes the miter slots). Major flaw. Problem #3, the left miter slot is wider than the right. When building a crosscut sled, I had to make two different width runners, one for the left, and a narrower one for the right. Another ridiculously major flaw with the quality of this saw. And the last gripe is that the fence is not flat due to the screws that attach the UHMW face. Each screw location pulls the surrounding material inward. This can cause inaccuracy, especially when sawing shorter pieces. 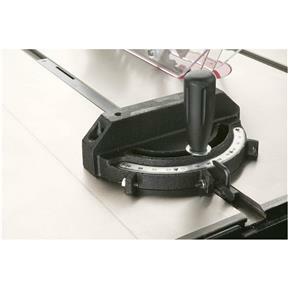 For many table saw issues, you can upgrade accessories to get better accuracy. A new fence and rail system, an aftermarket miter gauge perhaps. But there is nothing short of replacing the table or having expensive machine work done that can fix the miter slots. And for that reason, this saw gets 2 stars. And of course, I found all of this out once my warranty was up. From delivery(ups freight) to set up everything went so well. Assembly instructions were spot on and the blade to table alignment was perfect. Looking forward to a lifetime of use. This is a machine that I purchase in December 2016 and is the center piece of my shop and compliments almost every activity. It is very well designed, precise, quiet, and powerful. It has replaced a contractor table saw I used for years and pleased I spent a the extra money to to step up to 3HP, 240V G1023RL. This saw will last a lifetime. I ordered a Grizzly G1023RL table saw, which arrived one week later. I also ordered the H4231 Zero clearance inserts. It was easy to clean the Cosmoline from the table and extensions with WD40 (took all of 20 minutes). I could tell right away that this was an impressive, quality machine. Assembly is relatively simple (as long as you followed the instructions in the well written manual). The Shop Fox mobile base completed my package. While doing the various alignments, I discovered that the cast iron top was warped across the back of the table. It was determined that the back end of the top was resting on the trunion which was easily corrected by adding a 3/8" washer under the four cap screws that hold the top down to the base. My only complaint is the dust collection shroud around the saw blade. Pieces of wood will fall in, clog the vacuum port, and are difficult to remove. The H4231 Zero clearance insert instructions were inaccurate as it relates to this machine. The height of the tab at the back end of the insert had to be cut in half in order to allow the insert to drop into the throat. It was then a perfect fit. No other adjustment was needed. This is a well designed and well built machine, and accurate alignments are easy to make. It may not be perfect but then what is. Grizzly provides excellent customer and technical support. I couldn't be happier with my new saw. It has power to spare and runs true without bogging down under a load. The dust collection is quite good. It is solid, without vibration, and will last forever. Good quality machine for the money. I love this saw. Haven't had much time to use it, but this will be in the family for generations. I made my investment 2 months ago and very happy with my Grizzly table saw. I am looking to make investmen for a gift for my brother who would love to have one as well. I love this saw. I wish I had gotten it years ago. It's every thing Grizly claims it is. I am really enjoying the Grizzly saw. Great power and accuracy. Meets the standards as described on the website. Grizzly makes it absolutely simple to purchase these tools and ships them fast. Great experience for the second time. have had our g1023rl for a couple of months now. couldn't be happier with its performance!! looks great too!!! It is a good solid built saw. My previous saw from HD was horrible when it came to blade height and tilt adjustment but it did lasted about 12 years. The one before that was a Sears contractor's saw which lasted 24 years. I have had this saw for a few months now and so far, so good. Overall I like the saw but I would like to nit-pick a few things. I wish the fence rails would extend far enough left to get the full 16" rip left of the blade instead of only 8 inches. I would like pre-drilled holes on the right end of the rails to hang a table extension. I built a laminate top to fit the 16" gap because I banged my hip on the rails every time I walked by it. I had to rig a bottom support between the front and back rails to hold up the far end of the top. I would like to see an accessory extention offered to have a few more inches of rip capacity to the right. The 7 ft rail is just too long for my shop. Also, the Shop Fox fence seems much heavier than necessary and doesn't slide very easily. My old Delta with its "Uni-fence" was light weight but compleatly ridgid. The blade guard and riving knife are great but the release lever is hard to reach and I bruise my arm on the door opening when the lever snaps open. Another small anoyance is the location of the switch. It is too far under the front rail so I turned it around on its mount but now I accidentally hit the off button with my knee. Guess I will have to put it back. Bought saw a month ago upgraded from contractor saw huge difference so glad I made purchase. The saw is being used in a manufacturing facility for making everything from skids and crates to trimming polycarbonate for control panels. It is accurate, powerful, and very well made. It has made this area of the plant more productive and has proven to be nearly fool proof in use. It is a very good and solid saw, fence is very good a easy to adjust.. I purchased this saw and do like Grizzly table saws. But I have one gripe about this one, it has a poor dust collecting shroud around the blade. They built this one with a split dust hose 2 inch which removes some dust around blade and some from bottom of the saw . Jet has a 4 inch hose coming from blade shroud, don't know which works best. The shop fox fence is not that good, old style fence that you have to bump side to side to set on measurements, a real pain, plus the bubble is hard to read. I am changing it for a Incra TS-LS fence system that is more percise and accurate. The switch is to far back under the fence rail to reach comfortable, I had to move it out further also. I bought a Grizzly planer and jointer last year at the Muncy, PA facility just before it closed and got to see them before purchase. So I was a bit apprehensive about purchasing the saw sight-unseen. But the other machinery was good quality so I took the plunge, and it has worked out great. Ordered it on Friday Dec 30, and it arrived at my workplace (where we have a loading dock) the following Thursday. The packaging was great. Not a scratch on anything. I unpacked it in my garage on the utility trailer and took all the boxes with piece/parts to the basement workshop. Then I used an appliance dolly, and a friend, to take the main saw down the stairs with no issue. Spent about 5hrs Saturday just tinkering to put it together, including the mobile base unit I purchased. I was being very careful to adjust everything as I wanted to get it right. Everything assembled per instructions. First time I fired it up, it was smooth and quiet. I set the fence for 3" and ripped a piece of 7/8 cherry. Made a perfect cut. I had looked at SawStop, Powermatic, Jet and some others. But this saw is nearly half the price of the others and certainly appears to be every bit as good. I only had 2 minor issues, both with the ShopFox fence. During installation of the front angle bracket they tell you to align the top of the bracket to the bottom of the bevel of the saw top. Then during the installation of the tube the fence rides on, they tell you that if your saw has a beveled top, you need to install a 3/8 spacer (not supplied) between the angle bracket and tube to get the right height for the fence. I spent a half hour making some spacers then found out that for this saw they are completely unnecessary. So ignore the spacer comment on the fence installation for this saw. The second issue is the magnified sight window on the fence to see the measuring tape. It has a bubble top, so setting it on an exact 3", for instance, depends on how you move your head. If you are not looking straight down on it, you will be a bit to the left or right. But I will get used to this I guess over time. So a day into it, I am very happy with the saw. I will be giving it a good workout next week building by daughter some built-in shelving for her new house. Very glad I went with this table saw. I had been thinking of buying a Powermatic or Saw Stop but was having a hard time justifying the price, then I decided to look at Grizzly. I read a lot of good reviews on the grizzly saws and had one picked out, or I thought I had one picked out. Just before I placed my order for a saw I decided to talk to the people in tech support and try to see if one saw was better than another and if so why. I was on the phone for some time and the guy that helped me was great, I received a lot of info on the different saws. Long story short, I bought this one and it is great. It is a lot of saw for the money. I had no issues with the set up, and it has plenty of power. This saw will meet all of my needs. I have used Saw Stops before and other than the safety feature they have, this saw is just as nice in every way. Do not hesitate to call tech support if you are in the market for a saw as they have a lot of good info and are more than happy to help. If it was not for them I may not have purchased the Grizzly saw. Making such a big ticket item without actually seeing the product is daunting - at least it was for me. I relied heavily on the reviews, online videos and various forum discussions, and came to the conclusion that Grizzly made good products. This is an excellent saw at what I feel is a decent price, also comparing it to the competition. The fit and finish is comparable to saw priced much higher. The cast iron table and movement controls appear to be comparable as well. Customer service was excellent. I decided to write a review to provide others who are trying to decide another data point. 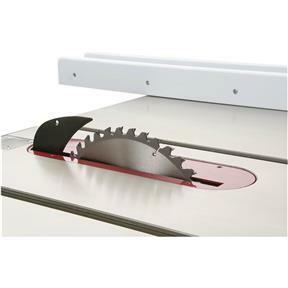 My search for a table saw started months ago first considering the hybrids saws (including the G0715P), but found myself gravitating towards the cabinet saws in the showrooms (I guess they can be considered showrooms) due to the extra power, sturdiness and full cabinet. The main reason that I started with the hybrids was due to footprint (space limitations) and price. I'm glad that I had the opportunity to actually see the hybrids and to compare them to the cabinet saws because I realized that my space concerns were unfounded since they have similar footprints. So with the space concerns gone, I expanded my search to include cabinets. However, those other brands were not within my budget. This brought me back to Grizzly and the G1023. In addition, it was on sale. I order it on Thursday and received it the following Tuesday. I put it together over two evenings. Not because it was difficult toe do, but rather I read through the manual, and checked and double checked the alignments: blade to rails, rails to fence, wings to table, divider to blade, miter, and blade angle. I only had to tweak the fence. Everything else was in good alignment. I picked up a 6-15p receptacle and made an extension cord for the 220VAC and fired it up. Well this thing was very smooth. I started looking around the garage for pieces of wood to test cuts and this thing was many times nicer that the inexpensive construction table saw that I am replacing/supplementing. My new G1023RL arrived this afternoon about 5:00pm. As I unpacked it, my excitement level grew exponentially. All I can say is WOW!!!. I have had my eye on this saw (or a similar Grizzly) for more than a year now. I cannot express into words how much this saw met and exceeded all my expectations from the moment I uncrated it, to the moment I fired it up for the first time tonight (getting goose bumps again). It probably doesn't mean much to you all, but when you've been working on a $100.00 Delta contractor saw for the last 10yrs., trying to put out quality woodworking pieces, having something of this caliber, suggests what I've always known. There is no limit to what you can build, when you have the right piece of quality machinery at your fingertips. As I told my son earlier this evening (while assembling the G1023RL), "you might as well help me put this thing together son, when I'm gone, it will be yours." Thank you all for your patience with me over the past few weeks (while it was on backorder). I hope I didn't bother everyone too much. But then again, shoot, I'd do it all over again for my next Grizzly machine. I ordered mine today and cannot wait to receive it. I have been in a similar boost as you. I have a craftsman contractor saw, though this several me well in my early years I have out grown this saw. I was beating myself up for over a week about which saw to pick. Something with your story I connected with and compelled me to purchase this saw. Thank you for your review!! !